What is Burst Pipe Technology? 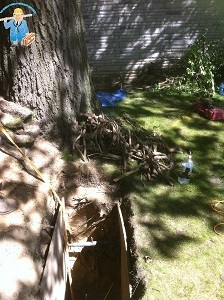 This is a method of trenchless plumbing, where clients may not want to excavate their property to replace damaged pipes. The bursting head (a large, cone-shaped device) is forced through the damage pipes underground. This destroys up the old pipe while simultaneously lays new pipe made from high-density polyethylene (HDPE). This method is preferred because it provides a seamless replacement from the inside. Bursting the pipe and laying the replacement uses the following steps. The new HDPE pipe is connected to the sewer system. There are several advantages to pipe bursting in trenchless plumbing repair. The cost, mess, and time loss with excavation are avoided. The ability to move around and use your property is minimally diminished. Repairs follow the current utility layout, so there is a lower risk of failure. Potentially better fluid flow than the previous pipe originally had, if HDPE pipe is larger than the initial pipe. HDPE pipe is less likely to corrode. Why is it a cost-effective trenchless pipe replacement service? Pipe bursting is both a reliable and effective pipe replacement, under the right conditions. Depending on soil conditions, you may end up with a pipe that is up to 150% larger in diameter than the initial pipe. Pipe bursting may not be suitable for every situation, like densely populated urban areas, due to the risk of cave-ins. Where it is an appropriate choice, it is usually the most cost-effective choice. This is due to speed of installation, long-term reliability and contained nature of the installation. Our strengths do not only lie in plumbing. We can also help navigating the insurance companies and bureaucratic red tape. You will receive all the necessary permits for our jobs. We will guide you through the City of Ottawa rebates for which you qualify. Our customers love us, and our work is the best quality. Stop by our testimonials page, and then give us a call. We’ll set up your free, no-obligation inspection for trenchless plumbing services in Ottawa.